While thousands of refugees are trapped outside Western Europe after risking their lives to get on the continent, those that have made it say they face an uncertain and, for now, lonely future. Courtesy photo from refugee in Germany, Sept. 19, 2015. "Don’t speak Arabic in front of the police,” Maged quickly whispered to me in Arabic, before I could ask whether he wanted milk in his coffee. "Do you want sugar?" I asked him in English, a little too loud to be natural. We were at the bus station in Dortmond, Germany, and Maged was leaving his group of friends to follow his dream in Sweden. It was the first time since the young Syrian men set off from Turkey to Europe that I had heard him admit being afraid. He was breaking a rule by choosing to apply for asylum in Sweden. But with hundreds of thousands of desperate travelers from the Middle East and Africa pouring into Europe, that regulation had already been broken so many times, no one knows what the laws are anymore. Technically, refugees in the European Union are supposed to register in the first country they land in. But thousands of people are jumping off rubber rafts on the Greek islands, often stabbing the boat on the beach so they can’t be forced to go back. The Greek government appears to have washed its hands of the problem, and refugees who can afford it move swiftly through the country to the Macedonian border. Maged and his friends took a commercial boat to Athens after they landed with thousands of other refugees. All of them were met by buses that whisked them to the border for a little over $50 each. There was no opportunity to apply for asylum in Greece. As Maged waited for his 4 a.m. train to Sweden, he was anxious to ensure that no one noticed he was a refugee. We had just left his friends at a refugee registration center in Germany, and he didn’t want to go back. “We want to register,” said Modar, Maged’s brother, a few hours earlier at the refugee registration center. He and two other young men had decided to trust their fate to Germany. 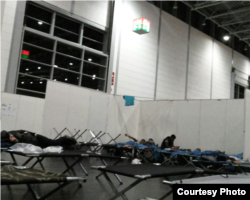 The German government has provided cots and space for refugees as thousands pour in. Refugees now in Germany say they fear the crowds coming in will make it impossible to sustain livable conditions. Courtesy photo from refugee in Germany, Sept. 19, 2015. “Go outside and the bus will take you to Dusseldorf,” the man told Modar, and they trudged outside into a misty parking lot. Omar, an aspiring college student and the youngest in the group, was excited. “Dusseldorf is beautiful,” he said. A German man was calling out names and loading people one by one onto the bus. Modar joined the scrum and asked how to get on the list. He was told to fill out papers. He went inside to get the papers, where they told him there were no papers. Finally, the dispatcher told him the truth. “Just wait here,” he said. As the sun fell, the weather turned colder and it began to rain. Many of them had just survived a long, bitter heat wave in the Middle East, and the sudden chilly weather was biting. There were also refugees from Africa, Afghanistan, Bangladesh and other places. For the first time since the five friends set out, they found Syrians to be in the minority among refugees on their trail. The longer we waited, the more drawn the men’s faces became. Even if they got onto a bus, would it take them someplace safe? “There are not many Syrians,” said Ahmed, looking around. "We can only talk to each other." Maged and I left the others at the registration center, waiting out in the cold. A few hours later, Modar appeared again online, messaging “Here!” to their Whatsapp group, and photos of what looked like a warehouse, with rows of black cots cordoned off by white dividers. Refugees in Germany say conditions are comfortable, but bleak. They are glad to have safe space but, they say, they hope in future to live normal lives in Europe after years of war. Courtesy photo from refugee in Germany, Sept. 19, 2015. In one photo, Omar sat on the floor, leaning on a cot and looking bored as he played with his smartphone. Meged promptly relaxed, and fell asleep where he was sitting. The next day, I visited the camp, with Meged still en route to Sweden. Following a Google map to Modar’s location, I walked right through the gate, before being stopped by security. “You can’t go there, it’s forbidden,” a young security officer said in English. I’m sure he noticed that I was alarmed. After hearing stories for weeks about refugees being locked inside camps, where had this group ended up? A few minutes later, Modar, Omar and Ahmed sauntered out of the gates. They were going to look for a gym. Ahmed, 23, had played soccer in Syria and was going to try to get on a team in Germany. “This place is good,” said all three men at different times, describing plentiful food, large, clean spaces and slow but working Internet service. But for all of the friends, their relative physical comfort opened up emotional space to feel their losses. The group had become fiercely loyal on the road, keeping each other safe. They had left their families, friends and all their possessions in Syria and had replaced what they lost with each other. And although they never planned to stick together once they got to Germany, they weren't prepared to give up that security. With only three left together, all with different dreams, they each faced an immediate future as a lone refugee in a giant mass of people, competing for resources, legal status and jobs.